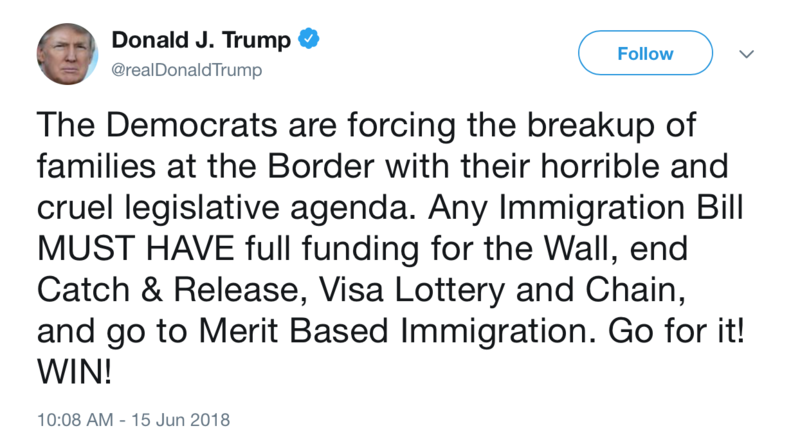 Here’s the immigration crisis in one sentence: Donald Trump is lying to the American people so he can use the fear and pain of hostage children and their parents to break the hearts of decent Americans, all in order to extort billions of dollars to fund a quixotic campaign promise he made on a whim and said we wouldn’t have to pay for. No other way to put it: This is evil. It’s a shadow of a genocidal worldview. Our government has chosen to terrorize and imprison a specific group of people for committing what’s essentially a misdemeanor. It’s such a deplorable policy they don’t even take responsibility: They have to lie about it. It is cruel. Here’s what it sounds like when we take children from their parents at the border. And here’s what a detention center looks like, from a video released by the U.S. government. Trump is a playground bully. He’s taking children and their parents hostage. We all know this behavior is sick and immoral and can’t be legitimized: If you keep paying the bully, he’ll keep beating kids up. At some point the SWAT team works out a way to raid a hostage situation. Congress, however, doesn’t exactly have SWAT-like courage. If you’d like more detail, I wrote a thorough breakdown of the administration’s systematic lies a couple weeks ago, so if you’re interested in the ins and outs of it, please check that out. The president and his attorney general established the new policy, which in simple terms changes the way we handle people who cross the border illegally. Before this April, crossing was a misdemeanor that didn’t require prosecution, though authorities had that option. Until now no administration, Republican or Democrat, chose to prosecute parents who cross with children, specifically because that decision would mean we’d have to separate families, which would be cruel. But Trump ordered the DHS to prosecute families, knowing that the existing law requires us to in that case separate children from their parents. 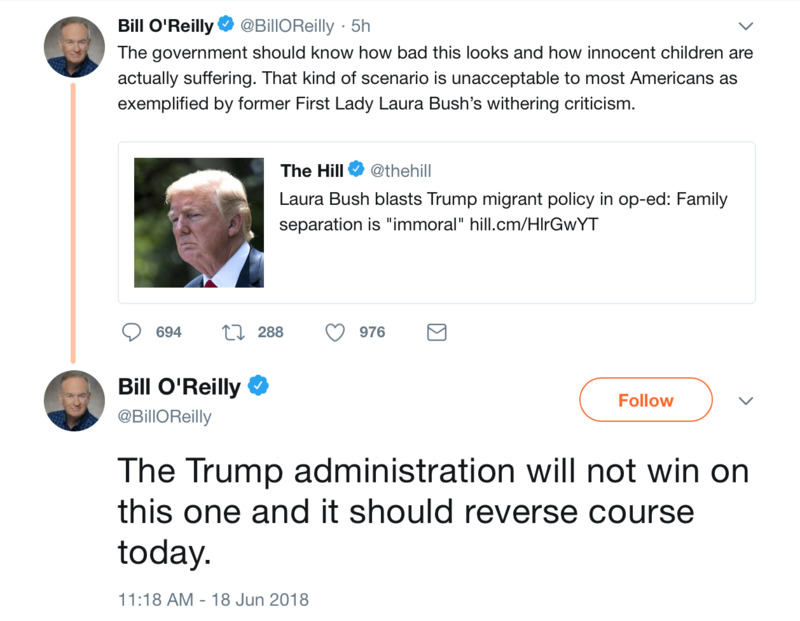 Right-wingers will be quick to point out President Obama also put kids in detention centers. Those were unaccompanied minors, and they were detained until family members or guardians in the U.S. could take them in. We never separated children from their parents before. 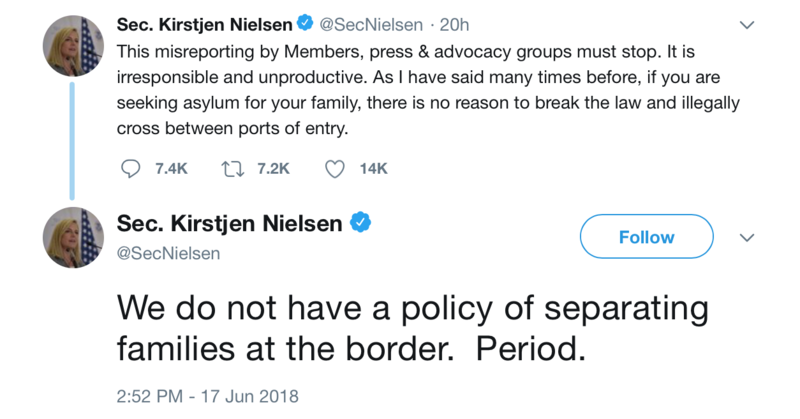 And even though it’s illegal to cross the border between points of entry, as Kirstjen Nielsen mentioned, that’s just a misdemeanor. Is that worth breaking up families? Thought experiment: You get too drunk one night. You’re charged with public intoxication, so the courts throw the book at you and put your three-year-old in a detention center indefinitely. Then they do this to thousands of people. Problem: This applies to any law of any government. Guess we better kill all the Jews. Hitler said we have to, and god said we have to obey Hitler. So of course, even if you buy into the premise that god ordains a government’s authority, god doesn’t ordain the laws of that government. Jeff Sessions gave the order to rip kids from their parents, admitted it, and then blamed god. Trump blames Congress for his choice. Victims of abuse will recognize this behavior. It’s worth noting the pattern here: Trump took the same approach with the so-called “DREAMers,” repealing DACA last summer and leaving it to Congress to fix. Trump throws a rock through your window, then blames you for being cold. Some congressional Republicans have begun writing legislation to resolve the issue. 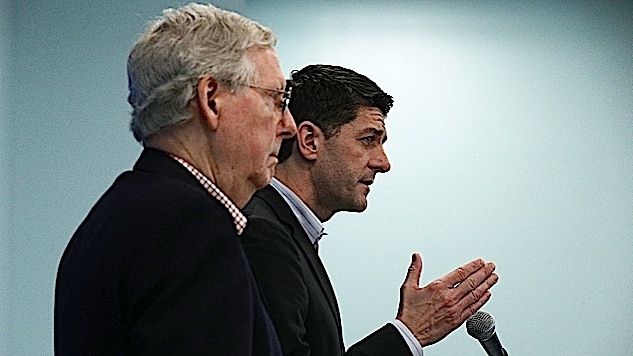 They’ve written two bills, one of them a hyper-conservative non-starter, the other a “compromise” for moderate Republicans. Those moderates, led by Paul Ryan, claim the compromise bill would stop the administration from separating families at the border. As reported by Vox, that’s a lie. The law doesn’t stop the Trump administration from choosing to prosecute asylum-seekers who cross between official ports of entry, which results in the separation of families. The bill doesn’t even force the administration to stop separating families who do claim asylum legally. What’s more, the GOP’s summary of the bill claims that “accompanied alien minors apprehended at the border must not be separated from their parent or legal guardian while in DHS custody.” But that’s not actually in the bill. It does not reverse the zero-tolerance policy. The bill does, however, instruct authorities to detain immigrant children with their parents the same way they detain adults. This means families wouldn’t necessarily have to beheld in special detention centers designated for families, but could be kept in general facilities. It also means parents and their kids can be held indefinitely, which changes part of the Flores settlement, which says border agents had to release kids “without unnecessary delay.” Courts have interpreted that to mean that the government can’t hold families with kids for more than 20 days, after which they were released to await trial. Trump calls this “catch and release,” which is how you talk about fish. If the new bill passes, though, kids can be held in detention facilities with their parents for months, even years, while they await a decision on their case. Usually that means deportation. This “moderate” legislation will also commit $25 billion for the border wall, and will offer DREAMers a narrow path to citizenship. Will it pass? Who knows. Trump himself threw it into doubt last Friday, when on a Fox & Friends interview he said he “certainly wouldn’t pass the moderate one,” even though GOP legislators tailored that bill to fit the four demands Trump made in January. To be perfectly clear: Trump is holding children hostage so he can build his wall. The vast majority of Americans don’t support a border wall, which is a stupid and ineffective waste of money. Also, no one is talking about Mexico paying for it anymore. “They don’t need legislation to change it,” Hurd said. But White House spokesman Hogan Gidley argued in a Fox & Friends interview that it was the Democrats’ fault for not being willing to compromise on immigration with Trump. “The Democrats decided to stand with people who are here illegally and unlawfully by the hundreds of thousands as opposed to hundreds of million of American citizens,” he said, referring to what were in reality bipartisan attempts this March to save DACA, efforts that Trump torpedoed. As of today, all Senate Democrats have signed on to support a bill that prohibits the Trump administration from taking children, some as young as eight months old, away from their parents at the U.S.-Mexico border.